Looking for something different in between big holiday meals? 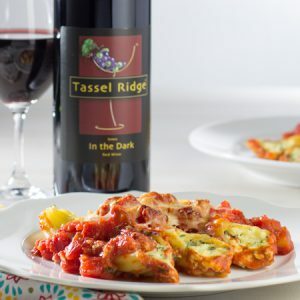 Try Baked Manicotti paired with Tassel Ridge Iowa In the Dark ! With oven rack in middle position, preheat oven to 375°F. Pulse 1 can tomatoes with juice in food processor until coarsely chopped, 3 to 4 pulses. Pour into large bowl. Repeat with remaining can of tomatoes. Heat oil, garlic, and pepper flakes in large saucepan over medium heat 1 to 2 minutes until fragrant, but not brown. Stir in tomatoes. Add ½ teaspoon salt. Simmer about 15 minutes or until slightly thickened. Stir in 2 tablespoons basil. Season with additional salt to taste. Set aside. Combine ricotta, 1 cup Parmesan, mozzarella, eggs, ¾ teaspoon salt, pepper, parsley, and remaining 2 tablespoons basil in medium bowl. Set aside. Pour 1-inch boiling water into 13 x 9-inch broiler-safe baking dish. Add noodles one at a time. Soak until pliable, about 5 minutes, separating with tip of sharp knife to prevent sticking. Remove noodles, placing in single layer on clean kitchen towel. Discard water in baking dish. Dry dish. Spread bottom of baking dish evenly with 1½ cups sauce. With short sides of noodles facing you, spread ¼ cup cheese mixture evenly over bottom three-quarters of each noodle leaving top quarter of noodle exposed. Roll each noodle into tube shape. Arrange in baking dish seam side down. Top with remaining sauce, making sure pasta is completely covered. Cover with foil. Bake until bubbling, about 40 minutes. Remove dish from oven. Remove foil. Adjust oven rack to uppermost position (about 6 inches from heating element). Heat broiler. Sprinkle remaining 1 cup Parmesan evenly over manicotti. Broil until cheese starts to brown, 4 to 6 minutes. Cool 15 minutes. Serves 6–8.